Commercial glue-down carpet disposal, much like indoor-outdoor carpet removal and disposal is one big job to tackle. This is due to the fact of how it’s installed in the space. As clearly given away by its name, it is secured in-place by a strong adhesive. This prevents creasing, a serious tripping hazard. It also prevents it from coming loose, which can also present safety hazards. To learn more about commercial glue-down carpet disposal and removal, read on below. As with any type of remodeling project, your first order of business is to prepare for the debris. This will quickly pile up as you work along, and become overwhelming if you haven’t planned for it. So, have a local junk hauling service ready to go. This way, when it’s time, all that material and debris can easily be picked up and taken away so you don’t have to deal with it. Often times, in offices and retail spaces, the carpet is commercial grade. This makes it more durable, to lessen the wear caused by heavy foot traffic. 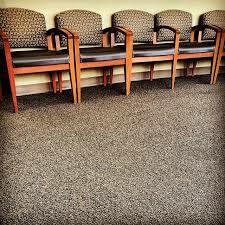 Over time, even commercial grade carpet begins to show signs of wear. Eventually, it must be replaced with new flooring. Score the carpet into sections. Start the process by cutting the carpet into four, six, or eight large sections. Use a utility knife to score into the carpet, taking care not to gouge the subfloor underneath. Apply mastic remover to the subfloor. After all the carpet is off the subfloor, you can then use mastic remover to get rid of the adhesive residue on the subfloor. Clean and disinfect the subfloor to finish. To finish the job and prep for new flooring, simply clean and disinfect using liquid dish soap and bleach. To dispose of the commercial carpet you’ll either have to rent a truck and haul it to the landfill and pay a hefty fee. Or, you can simply phone 800-433-1094 or visit Junk Garbage Removal.